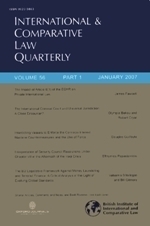 The second issue of International and Comparative Law Quarterly for 2014 includes one short article on private international law. In Figueiredo Ferraz v Peru the US Court of Appeals, Second Circuit, deployed the doctrine of forum non conveniens to decline to enforce an arbitral award against Peru. The award had been rendered in Peru and the successful party in the arbitration sought to enforce it against Peru’s assets in New York. This article argues that, contrary to the Second Circuit’s approach, when the merits of a dispute are decided in an arbitration seated in one jurisdiction and the arbitral award is then presented to a court in another jurisdiction for enforcement against the award debtor and its assets within the jurisdiction of that court, neither forum non conveniens nor any rule performing the same function should arise.